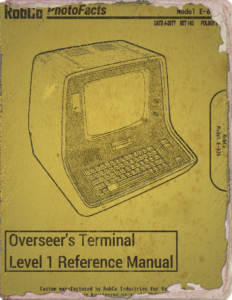 If you have Fallout 4 and the DLCs, you may have discovered the “Vault-tec Population Management System” which takes the physical form of a floor standing console. It looks nice, but I wanted a good old desktop terminal one and not that “made from junk” one that came with the base game. If you are interested, you can find the mod over at NexusMods.